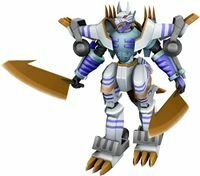 Possessing the attribute of "Light", it is one of the legendary Ten Warriors Digimon that saved the ancient Digital World. An Ultimate who existed only in the distant past, it is called the "Supreme Shining Beast". Ancient Garurumon's abilities were later passed on to the "Beast Digimon". 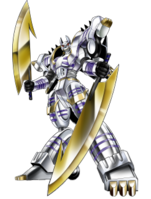 It is said that in the previous crusade, it survived to the end alongside Ancient Greymon, and sealed away Lucemon. 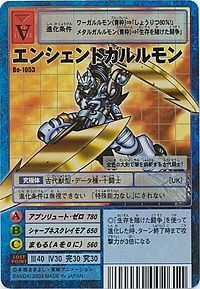 Its Special Moves are brandishing its two greatswords with a dazzling brilliance and cutting the opponent to pieces (Sharpness Claymore), and completely halting the movement of electrons with super-cold air at absolute zero and a super-ray of light (Absolute Zero). Title: 「伝説の光の闘士」 — "Legendary Warrior of Light"
「光り輝く至高の獣」 — "Supreme Shining Beast"
| Ancient (「エンシェント」 Enshento) means of time long past. | Garuru (「ガルル」 Garuru) is the sound of a growl. 3.1.2 Revival of the Ancient Digimon!! 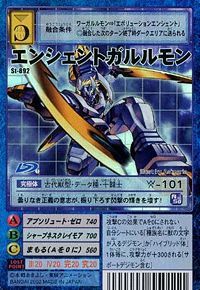 Absolute Zero  アブソリュート・ゼロ Abusoryūto Zero Absolute Zero Completely stops electron movement in the entire body of the enemy with super-cold air and a ray of light. 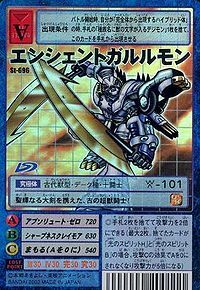 Sharpness Claymore  シャープネスクレイモア Shāpunesu Kureimoa Sharp Claymore Cuts the enemy into pieces with its greatswords. 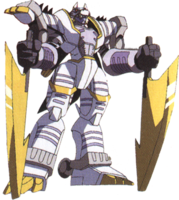 First appeared in Digimon Frontier: Revival of the Ancient Digimon!!. 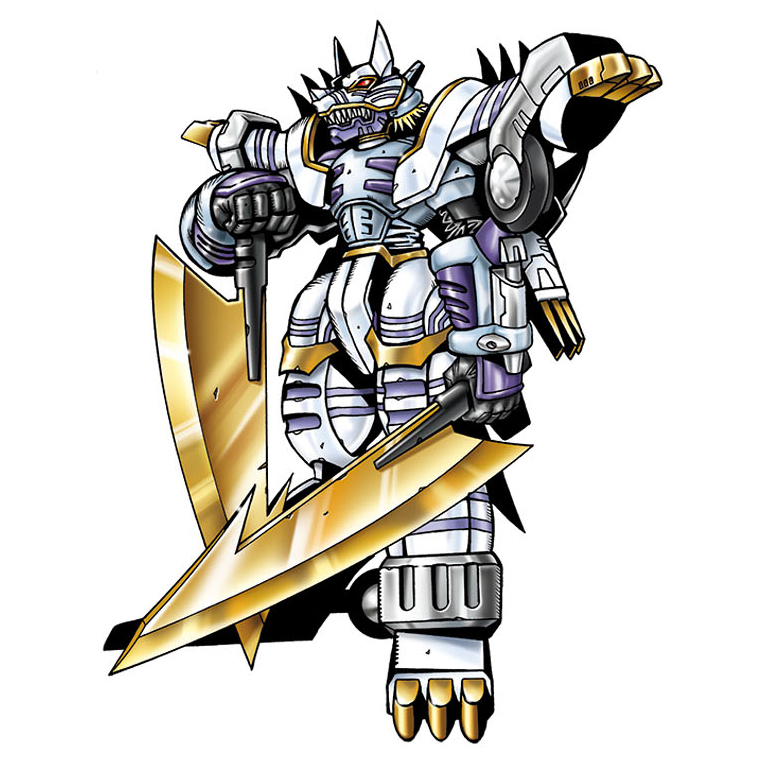 Ancient Garurumon was one of the Legendary Warrior Ten whose spirit was reborn in the Human Spirit of Light to create Wolfmon and the Beast Spirit of Light to create Garummon. 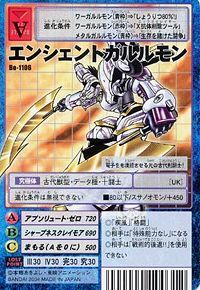 Ancient Garurumon somehow revives to battle against Ornismon. Ancient Garurumon appears very briefly whenever Kouji uses the Ancient Spirit Evolution attack. 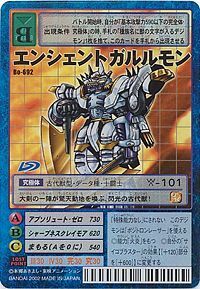 Ancient Garurumon can only be obtained as a collectible card. Its card is part of the Warrior Ten (十闘士 Juttoushi) set. 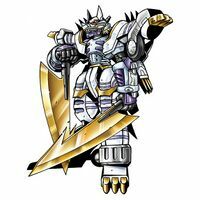 Ancient Garurumon is available as a Digimon Medal. This ancient, super beast warrior is armed with large, holy shining blades! Its swinging light-speed attacks shine brighter from its unclouded will of justice! One gust from the large swords of this ancient beast of flashing light cries out astounding! This ancient warrior slices through darkness in a flash with its golden greatswords! This ancient swordfighter of light freezes even electrons! 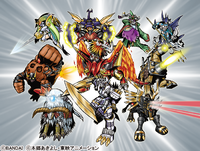 Digimon Frontier: Revival of the Ancient Digimon!! 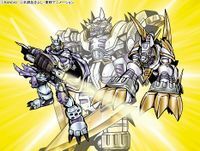 Digimon Frontier: Revival of the Ancient Digimon!! This page was last modified on 5 April 2019, at 06:23.